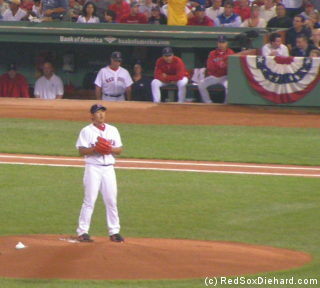 For Game 2, the Red Sox sent Daisuke Matsuzaka to the mound, while the Angels countered with Kelvim Escobar. This game didn't have the same brisk pace that Josh Beckett had brought to Game 1. Dice-K threw 31 pitches in the first inning. He struck out Chone Figgins to open the game, then walked Orlando Cabrera on a full count. After getting Vladimir Guerrero to pop up to first, he gave up a single to Garret Anderson, and then went to a full count on Maicer Izturis before striking him out to end the threat. The Red Sox offense went to work in the bottom of the inning, and they also worked the count, forcing Escobar to throw 30 pitches. Dustin Pedroia grounded out, but then Kevin Youkilis worked a full-count walk, and David Ortiz continued his torrid hitting with a single. Manny Ramirez flied out to center, but Mike Lowell walked to load the bases with two outs. That left any scoring up to J.D. Drew. Drew had signed a lucrative contract in the off-season, but hadn't produced much at the plate all year. But in this at-bat he took strike one, then lined a single up the middle to drive home two runs and give the Sox the early lead. Even after being staked to a 2-0 lead, Matsuzaka continued to labor. In the second inning, a walk and a single put runners at the corners with no outs. Dice-K got a strikeout, but then a groundout drove in a run, and back-to-back doubles by Figgins and Cabrera drove in two more to give the Angels a 3-2 lead. Finally, after squandering the lead, he settled down. He did allow the leadoff batters to reach in the third and fourth, but managed to get out of the innings quickly without any further damage. As his pitch count escalated, he retired the first two batters of the fifth. But when Izturis reached on an infield hit, stole second, and went to third on a wild pitch, and Casey Kotchman walked, that was the end of the night for Dice-K. Javier Lopez came in and retired Kendry Morales on a groundout to end the inning. Meanwhile, Escobar had quieted the Red Sox bats. Big Papi worked a walk in the third, and Coco Crisp beat out a bunt single and stole second in the fourth, but no one else reached base during Escobar's second trip through the order. Dustin Pedroia got his first hit of the postseason when he led off the fifth with a double. Youkilis gorunded out, and with the red-hot Papi up and first base open, Angels manager Mike Scioscia took no chances and had Papi intentionally walked (as the crowd chanted "Manny, Manny" through the whole at-bat). Ramirez fouled off a few pitches, including a popup into the stands. It looked like Jeff Mathis would have a play on it, but with the extra photographers' well placed in front of the first row of seats for the playoffs, he had to reach into the stands, where it was caught by a teenage fan in the front row just before Mathis could make the play. That gave Manny new life, and he ended up walking to load the bases. Mike Lowell came through with a sacrifice fly, tying the game 3-3. Escobar got Drew to ground out to end the inning, but he was over 100 pitches, and the rest of the game would have to be waged by both teams' bullpens. The bullpen had been a strength for the Red Sox all season long, and it continued to be in the playoffs. Manny Delcarmen got through the sixth and started the seventh. Hideki Okajima finished the seventh and opened the eighth. Jonathan Papelbon took over with two outs in the eighth and withstood an error, a walk, and three stolen bases. He was back for the ninth and got all three outs on popups to short. For the Angels, it was Scot Shields and Justin Speier who kept the Sox off the board. Julio Lugo singled to lead off the ninth, and with one out, Scioscia went to the pen again to bring in closer Francisco Rodriguez. 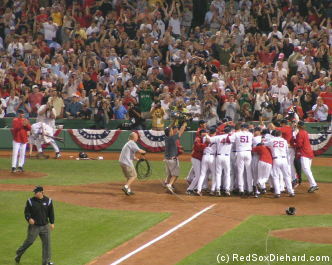 K-Rod struck out Youkilis, but Big Papi was next. He had sent the Angels home empty-handed in 2004 with a series-clinching walkoff home run, and Scioscia wasn't about to let that happen again. Papi had been on base every time up this game, and in fact the Angels had only managed to retire him once in this whole series. So he was intentionally walked, and again the crowd chanted "Manny, Manny" with every ball. Walking Manny would have put the winning run on third, so they chose to pitch to him. It was almost 12:45 am when Ramirez came to the plate. He took ball one, but the next pitch was more to his liking. He drove it deep into the night, high over the Green Monster, a no-doubter from the moment it left the bat. 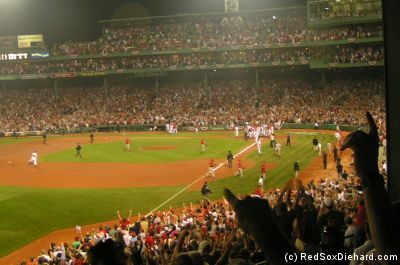 Manny stood at home plate, arms raised in triumph as the ball sailed into the October sky and the game crossed into the win column for the Red Sox, before circling the bases, flipping his helmet, and leaping into a sea of delirious teammates. After the game, Manny did several interviews, even though he hadn't talked to the media all year. Saying he hadn't felt right all season long, he gave us this gem: "When you don't feel good and you still get hits, that's when you know you're a bad man." The bad man was very good that night, and the Red Sox took a 2-0 series lead. This page copyright © 2008 by Kristen D. Cornette.